Fear of Slave Rebellion in Upstate New York. On March 14, 1794, two young slave girls, and a male slaver were hung for the fire in Albany, 1793. On November 17, 1793, a fire burned down a large part of downtown Albany, including offices, stores and 26 homes, causing a huge sum of damage.In the aftermath of the fire, the slave-owners of the city quickly inferred that it had been set by slaves. All the slaves in Albany were then subjected to curfew, as well as being rounded up and interrogated. 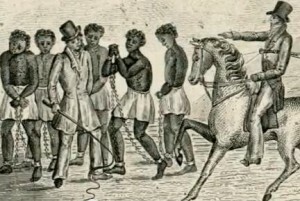 Pompey, a slave belonging to Matthew Visscher, and two teenage slave girls: Bet, owned by Philip S. Van Rensselaer; and Dinah, belonging to Volkert Douw were all implicated for igniting the fire by the "confession" of Bet. Supposedly Pompey approached the girls because two white men wanted them to set fire to an Albany merchant home, named Leonard Gansevoort. On the night of the fire, the 17th, Bet and Dean took live coals and placed them in a lantern, accompanied by Pompey to the Gansevoort stable, where supposedly Pompey put the coals in a pile of hay. The fire spread quickly, and by the time it burned out the following morning, most of the block bordered by Broadway, Maiden Lane, and James and State streets was destroyed. On March 14, 1794, the two young slave girls were hanged in Albany, N.Y. Dinah, was 14, and Bet, was just 12. A month later, 16-year-old Pompey was hanged as well. It is unknown wether the three actually ignited the Albany fire, or were forced into a false confession. One thing that is weighed heavily is the fact that upstate New York slaves in 1793 could buy their own freedom, which could have been a factor in why the three agreed to set the fire. 1 citation text "Dinah, Bett and Albany, N.Y., Slave Rebellion." Workers World. 2015. Accessed March 30, 2016. http://www.workers.org/articles/2015/03/19/dinah-bett-and-albany-n-y-slave-rebellion/. 2 citation text"History of the 1793 Fire in Albany." - Hudson Valley Magazine. Accessed March 30, 2016. http://www.hvmag.com/Hudson-Valley-Magazine/February-2014/History-of-the-1793-Fire-in-Albany/. Dezire Jones, “Albany Fire of 1793.,” Albany Walks for Health, accessed April 20, 2019, http://www.albanywalksforhealth.com/items/show/141.